Pighammer is the only solo album by Wayne Static released on October 4, 2011 through Dirthouse Records and his final album before his death. It debuted at number 97 on the Billboard 200 with first week sales of 4,700. "The Pighammer concept conjures up bizarre images. It's about a mad plastic surgeon, with a pig fetish, that likes to convert hot chicks into pigs. It is the total opposite of what a plastic surgeon would do. He has this crazy hammer device made from a pig foot. The images of the surgery in the CD package are only a dark comedic visualization of the real theme of the album, which is my transformation." Static's "transformation" was in reference to his decision to stop his drug use as of 2009. Static wrote the album as a tribute to his new drug-free life, in hopes of inspiring others to get clean as well. 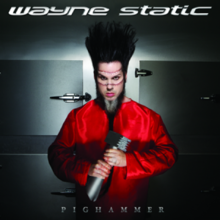 ^ a b c "Wayne Static: 'Pighammer' First-Week Sales Revealed". Blabbermouth.net. 2011-10-12. Archived from the original on 2012-09-10. Retrieved 2011-10-16. ^ "Static-X Founder Wayne Static Passed Away At Age 48". Rockrevoltmagazine.com. 2 November 2014. Retrieved 1 February 2019.